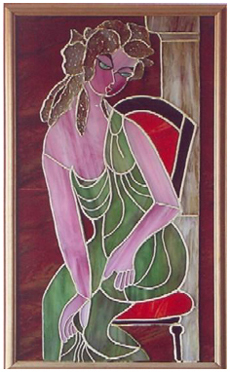 Rose F. Mehta took to painting on glass, giving them the illusion of stained glass; but she was not satisfied with the effect. Then in 1994 she got an opportunity to visit New York. She enrolled in an intensive three months' programme in the art of real stained glass work. Two years later she again went to New York and did a short course in making Tiffany style lamps. Therefore, in between assignments, she began making genuine stained glass wall hangings, in both opaque and clear glass forms. Instead of wielding a brush dipped in paints, she chooses suitable coloured glass, trims them to shape and then joins them into the desired pattern. This lends her artwork a distinct eye-catching relief. These are then mounted in frames like any painted canvas, without covering it with a glass pane. As far as possible, she has made her wall hangings in matching pairs; to create harmony on either side of an entrance door and window, or just across a wall. 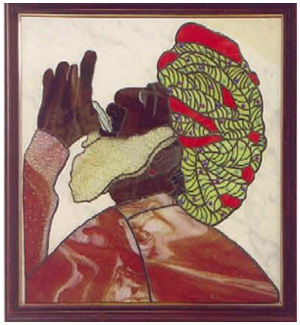 Most of her works are from stained glass design magazines, old masters or of her own creations. This exhibition, which has close to fifty such pieces, is a collection spread over four years. She has given two live demonstrations of this form of art- once on Hyderabad Doordarshan, as well as on ETV, a local TV channel. She has been interviewed many times by newspapers and magazines. In 1998, while she was in the USA, she took part in a competition organised by, 'Delphi Stained Glass Catalogue,' a leading trade magazine. She won a prize in their 1988-1999 Delphi catalogue, for one of her works accepted and published in their magazine, with a nice write-up.